Rising from obscurity in mid-nineteenth century America, Charles Francis Hall made three journeys to the Arctic in eleven years driven by a missionary passion which wrote him forever into the history of the North. Hall, whose missionary fervor was sparked by his desire to rescue the survivors of the lost Franklin expedition, is a major figure in Arctic history for many reasons. His decision to live among and like the Inuit marks the first clear departure from the traditions of European Arctic exploration; the explorer John Rae had imitated the Inuit but Hall was the first to learn to live like the Inuit by living among them. Hall also successfully gathered and recorded a mass of Inuit recollections of the last days of the Franklin Expedition. It is this work that forms the basis of David C. Woodman's two insightful books re-considering the Inuit testimony. On his third and last expedition, Hall reached the furthest North attained up to that time -- and then died, possibly as a result of poisoning. Until Chauncey C. Loomis wrote Weird and Tragic Shores, the ground-breaking biography of Hall published in 1971, the only other books on the man were Hall's own Life with the Esquimaux and the two posthumous American Navy accounts of his last two expeditions, all published in the nineteenth century. The Loomis biography is a hallmark work, singularly so since as part of it Loomis had Hall exhumed and subjected to some forensic analysis. This revealed that Hall's arsenic levels had been extremely elevated in the last two weeks of his life. Even so Loomis refused to conclude that Hall was murdered. He pointed out that arsenic was used in numerous treatments in the nineteenth century and that it might even have been self-administered. Loomis had the last word for over 30 years until the recent publishing flurry of Hall-related books. Two examining the question of his murder have both just been recently published -Trial by Ice by Richard Parry, and Fatal North by Bruce B. Henderson. Hall's translator Tookoolito is also the subject of Midnight to the North by Sheila Nickerson, and both the Loomis biography and the nineteenth-century Arctic Experiences: Aboard the Doomed Polaris Expedition and Six Months on an Ice-floe by George E. Tyson have been recently reprinted. If you didn't know better you'd think it was a conspiracy. Conspiracy and murder both play major parts in Richard Parry's Trial on Ice, which has just appeared in paperback from Ballantine Books. According to the hardcover edition's dust-jacket, Parry has previously published several novels set in nineteenth-century America. Although none of them are set in the the Arctic, Parry's background is nevertheless well-suited to the subject of Charles Francis Hall's Arctic murder mystery -- he is a medical doctor who lived in Alaska for twenty years. During his last expedition, Hall commanded the USS Polaris on an American Naval attempt on the north pole. After a brilliant run further North up the Greenland coast than anyone had ever been, Hall anchored and set out on a brief sledge journey. He returned on October 24, 1871 was struck violently ill and was dead on the 8th of November. Was Charles Francis Hall murdered? And by who? 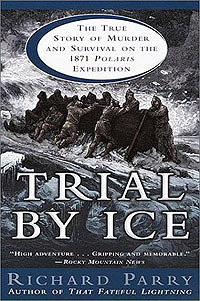 This is the revelation promised by the subtitle of Richard Parry's Trial by Ice "The True Story of Murder and Survival on the 1871 Polaris Expedition"
Yet there is an unevenness right from the get-go in Trial by Ice. Parry correctly points out -- for the first time, I believe -- that the Polaris was a badly designed ship for Arctic service. Its narrow hull design guaranteed that it would be caught when nipped in the ice pack, unlike the round bottomed broader ships such as the British had discovered would rise up in the freezing ice instead of being crushed by it. It was originally an unused steam tug called the Periwinkle and was chosen by the Navy simply because they already owned it. On the other hand when he's describing the loading of the Polaris he offers "In one corner the workers loaded a cabinet organ donated by the Smith Organ company. No one drew the parallel that Sir John's (Franklin's) party had carried two organs." This comment is completely fatuous. Does Parry really think that all Arctic expeditions with organs on board end in disaster? What about the organ on board the Prince Albert of Kennedy and Bellot? Granted popular accounts are different from academic histories: Loomis was a professor working on a postdoctoral fellowship; Parry is a writer out to tell a good yarn. But is Parry writing historical fiction or history? "I am the commanding officer of this vessel," Hall fumed. "I ordered you to keep my journal. You are to write what I dictate." Meyer must have glanced furtively at the chief scientist. Seeing support in Bessel's dark eyes, he squared his shoulders. "I cannot, Captain. It interferes with my primary duties as meteorologist." Meyer had considered adding the word regret but decided against it. From the corner of his eye he saw Bessels nod his head. Parry here exhibits many of the reflexes of a novelist. The lack of acknowledging where the dialogue has come from throughout, while doubtless done so as not to interrupt the story, further highlights its artifice. The crew for many reasons (not the least being Hall's own civilian status) was largely non-Navy. There was a completely German scientific team, no fewer than three sometime Captains and eight Inuit of varying ages and gender. The head of the scientific team was the German Dr. Emil Bessels, the acting captain was Sidney O. Budington (Hall was commander but never really a "captain") and the assistant navigator, a friend of Hall's, whom Hall had once wanted as Captain, George E. Tyson. Upon Hall's demise the crew split into factions with Bessels and Budington (now officially in charge of the ship) contending for control. After Hall's murder, Emil Bessels seems to fade into the background of Parry's account and Sidney Budington becomes the focus of his antipathy. Many of the crew reported that Budington was regularly drunk in the months following Hall's death, using his key to the alcohol supplied for preserving specimens. Parry goes out of his way to revile Budington, a successful whaling captain who had carried Charles Hall on his first voyage north some ten years earlier. In Trial by Ice, every action of Budington's is motivated by fear and he is an unredeemed drunk who supported Halls murder. Parry fails to examine the early history of Hall and Budington, who were great friends until an incident over Hall's Inuit companions, Ebeirbing and Tookoolito. Hall had left the Inuit at Budington's house while he was lecturing and trying to raise money for his next expedition. During this time Budington offered to return the Inuit north on his next whaling expedition. The Inuit did not prosper under Hall's treatment while they were in America and it's quite arguable that Budington's offer was out of kindness. Most conspicuously missing from Parry's small (and admittedly incomplete) bibliography are two works that throw much light on Hall's relationships with both the Inuit couple and with Sidney O. Budington. The works are Hall's own Life with the Esquimaux and the J.E. Nourse account of Hall's second journey. Hall's Esquimaux reveals his first meeting with the Inuit couple and his early friendship with Sidney Budington which Parry never mentions. The Budington of the barque George Henry is omitted. Is it because Parry simply hasn't read it? I also would have liked to have read more of the reactions of Ebierbing and Tookoolito to Hall's death and more from their point of view while adrift on the ice flow, other than the regular enumeration of Ebierbing's hunting successes. Admittedly the Inuit left no journals. The final turning point on this expedition comes when the Polaris is torn from its anchorage in an Arctic gale while preparing to abandon ship, leaving half the crew on the ice floe and half on the ship. The floe crew undergo starvation and deprivation for 6 months before being rescued. Budington grounds the Polaris and over winters before setting out in boats and ultimately being rescued. Parry ultimately says "Was Buddington a willing or unknowing accomplice? His actions after Hall's death suggest that he knew or suspected more than he let on." Parry suggests that Bessels and Budington pretended the ship was in greater danger than it was. On October 15th, the night the crew was split in two, Budington deliberately told Tookoolito to go on the ice despite the fact that the fireman had told her otherwise. In addition, Bessels' papers were somehow retained throughout the entire panicked abandonment while others were dumped. These circumstances certainly are suggestive. The notion that the separation was no accident is new. Clearly the crew left on the ice floe saw the ship return and wondered why the Polaris didn't see them and come to their rescue. And it's certainly true that Budington made no effort to rescue them. Parry must be commended for his clear medical analysis of Bessels' treatment of Hall and the simple verdict of murder which Loomis refused. Possibly the single clearest contribution of Parry to the Hall murder debate is his professional medical interpretation of Bessels' treatment of Hall. His knowledge makes quite clear for the first time the inconsistencies and of Bessels' treatment while showing how much his recorded behavior is consistent with someone administering poison. Most intriguingly Parry notes that in Davis's account "On June 4, 1873, when prospects of his two boats being rescued by sealing ships grew certain, Captain Buddington became deathly ill after eating supper…and for a time there was doubt of his recovery…Was Emil Bessel trying to tie up loose ends?" This is a chilling observation which suggests a poisoner who can't seem to get the lethal dose right. As for a motive Parry offers the notion that Bessels had thought himself enough of an explorer to replace Hall and points out his persistence in sledging expeditions after the grounding of the Polaris, despite his obvious inferiority. To Parry's credit he unequivocally says Hall was murdered by Bessels. But Parry goes beyond asserting Hall's murder and Bessels as murderer, he suggests "Possibly Bessel was working under orders from Bismarck to sabotage the American effort. Did Germany feel threatened by the prospect of an American presence at the North Pole and by closer ties between Denmark and the United States?" Hall murdered by Bismarck's orders? Both Loomis and Parry refer to a telling interview with Bessels many years after the Polaris expedition. In it is revealed that Bessels' spent ten years working on his report from the expedition. A man who hid out for a decade in the Smithsonian until they finally evicted him by replacing his office with a washroom is not a man who was a successful secret agent. Surely Bismarck could have found his assassin a job -- especially one who got away with it so completely. This is another example of Parry exaggeration for the sake of dramatic effect. But the effect is melodramatic and feels false and contrived. This book overall is not a clear, clinical examination of what happened; it is a widely uneven adventure yarn. There are telling observations throughout, but too often Richard Parry seems to be flailing in a sea of innuendo. The book is also full of mistakes. At one point Parry writes "a weary Charles Tyson arrived in St. John's aboard the Tigress on October 16" Who the heck is "Charles" Tyson? Clearly when he sailed his name was George. Errors like this are baffling. In another instance Parry writes "The first US exploration to discover the North Pole had failed in every way." The first 'exploration'? 'Exploration' is a curious word here instead of "expedition" and "first" seems rather arguable. Aside from Elisha Kent Kane's obvious attempt, concealed as a Franklin search expedition, what about Dr. Isaac Hayes' expedition of 1860? While obsessed by the open Arctic sea notion, Hayes, Hall's nemesis, was also after the Pole. In his final chapter "aftermath" he writes "Richard E. Byrd did land at the North Pole using an airplane in 1926, followed in that same year by Roald Amundsen and Lincoln Ellsworth in a dirigible flown by Umberto Nobile." This statement is simply wrong. Byrd never landed on the Pole and neither did Amundsen and Ellsworth - their expeditions were fly-overs. There is one major spelling issue with Parry's text. The names of the evil protagonists Parry directs our suspicions towards are Dr. Emil Bessels and Sidney O. Budington. Yet throughout Parry's work they are given as Dr. Emil Bessel and Sidney O. Buddington. Did Parry compensate for losing Bessels' 's' by giving Budington an extra 'd'? Loomis and Davis both agree on the spelling and it's not Parry's. Kenn Harper in his review of the Nickerson book elsewhere in this very issue provides some handy info on the subject. He notes a similar mis-spelling by Nickerson. He writes "The names of Captain Sidney O. Budington and his uncle James Buddington are both spelled as Budington throughout, although James always spelled his surname with two 'd's " So perhaps this is the source of the confusion. But how did Bessels lose his 's'? Even if authors of historical yarns do not have to be as accountable as scholars one would hope the editors Parry thanks so effusively in his 'Acknowledgments' for their "attention to detail" and "commitment to excellence" might have noticed.